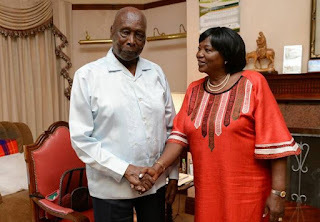 Kenya’s first First Lady Mama Ngina Kenyatta paid a courtesy call to retired president Daniel Arap Moi over the weekend at his Kabarak home in Nakuru county. Details of the visit have not been revealed yet,but rumors have it that the discussion between the two revolved around the political future of the country as everyone is preparing for the August general election. The longest serving Kenyan President, who took over from founding father Mzee Jomo Kenyatta, to become Kenya’s sophomore Head of State, expressed his happiness to meet with Mama Ngina Kenyatta, noting the friendship between the two families is growing stronger. Moi's son and Kanu chairman Gideon Moi is expected to announce whether the independence party will back the reelection bid on Ngina’s son President Uhuru Kenyatta or join the ODM. Gideon was last week given a two week ultimatum during a convention between the party delegates, to deliberate on which side of the political divide the party would join or if to go it alone in the polls. Recently, its Secretary General Nick Salat declared that Kanu will work with the National Super Alliance. He spoke during the inauguration of Nasa, on January 12, that Kanu was firmly in it. The remarks however split the party’s top brass in the middle with a section of it saying Salat’s statement was personal rather than representative of Kanu. In 2016, President Uhuru Kenyatta personally called Gideon Moi, urging him not to join the Opposition, that his family interests would be served better in Jubilee. The two are known childhood friends.